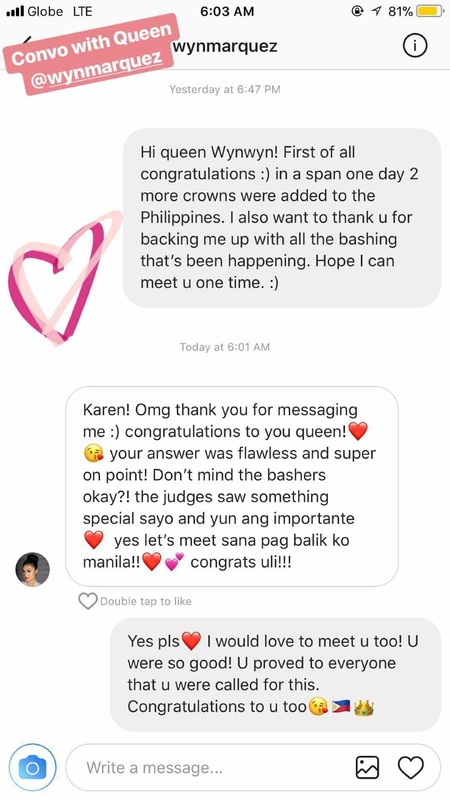 Newly-crowned Miss Earth 2017 Karen Ibasco thanked newly-crowned Reina Hispanoamericana 2017 Teresita Marquez for defending her against criticism and mockery in social media. Karen! Omg thank you for messaging me :) Congratulations to you queen! your answer was flawless and super on point! Don't mind the bashers okay? the judges saw something special sayo and yun ang importante, yes let's meet sana pag balik ko manila! congrats uli!! In less than 24 hours, the two Pinay brought home their respective titles. Karen Ibasco was named the fourth Filipina Miss Earth winner on November 4 while actress Teresita "Winwyn" won the country's first Reina Hispanoamericano title in Bolivia on November 5, Philippine time.